While creating universally designed instruction and activities is highly beneficial to students, it isn’t always easy to think through how to best accomplish this. The tools below will help you to not only design great activities and instruction, but to also begin to perceive the course through the eyes of your students. 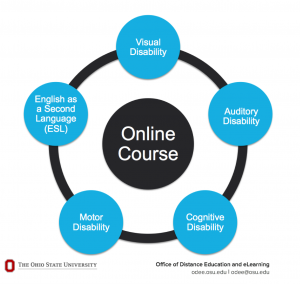 The ODEE Resource Center has full of great “on demand” resources related to all aspects of Carmen and other OSU supported technologies. There is also a designated space for “accessibility”, which will provide you with step by step guides, tutorials, FAQs and videos to help ensure your class is accessible and usable for all. The Office of Distance Education and eLearning main page has a section dedicated to Universal Design and Accessibility. 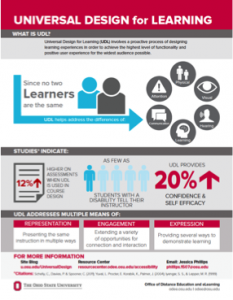 This space provides a high-level look at these important design considerations and shows how Distance Education has meaningfully integrated universal design and accessibility into its online course development process. 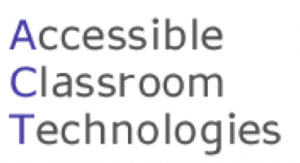 The Accessible Classroom Technologies (ACT) wiki is a repository of tips, guidelines, techniques, and other resources dedicated to making classroom media and other technologies at OSU usable for everyone, including people with disabilities. Use this flyer to learn more about Universal Design for Learning (UDL) or share it with colleagues or those interested in spreading the world about UDL. This document provides insight on how to approach UDL, along with supporting statistics. Use this tool to explore the unique needs and experiences of students with visual, auditory, cognitive, and motor disabilities, as well as students for whom English is a second language. This tool will take you through each student’s unique challenges with online learning, thereby giving you some insight into how you can design your course with these students in mind. Happily, by proactively considering these students, you are providing a better experience for all students in the course. Using the Wave Toolbar can help to determine whether or not a website has a significant number of accessibility errors, which can then help you to determine if that website should be used in the course or if alternate websites will be needed that cover the same content that are accessible for all. 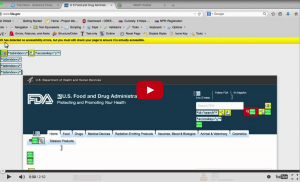 This introduction to the Wave Toolbar provides an overview of how to obtain and use the toolbar as a starting point for determining accessibility. Keep in mind that the Wave Toolbar is helpful to get a sense of whether or not a site is accessible but it is still important for you to consider the website yourself from a variety of perspectives to truly determine whether or not you should use it in the course. Use this tool to caption your videos or screencasts. 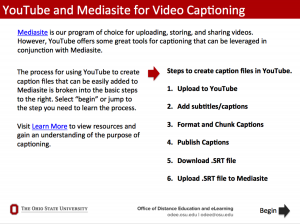 By using YouTube’s free service, creating an .SRT file, and uploading to Mediasite you can easily ensure that every student gets the most out of your lectures and instruction. This tool walks you through the simple steps involved in making your videos accessible, thereby avoiding issues in the future and benefiting all students in the course. This occasionally updated list of resources includes many from above, as well as brief descriptions of the use for each resource. This is just the tip of the iceberg of the available knowledge of UDL and Accessibility. You are encouraged to do your own research and find answers that are specific to your needs.